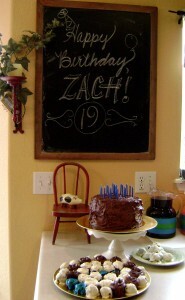 Our nephew Zach turns 19 today! He is my brother Tim’s oldest son. 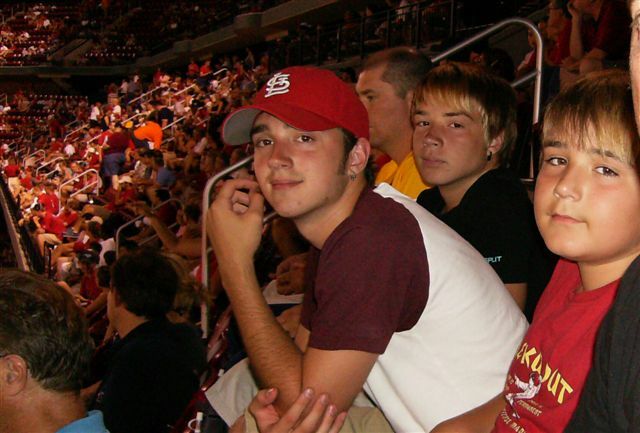 He is pictured below with his younger brothers Seth and Caleb. Tim and his wife Julie have turned out some awesome boys (BTW: loving the St. Louis Cardinals is a Moslander-family rule)! Zach is living with us while he works and is doing a ministry internship (worship arts) at Northern Hills. We feel honored to have him here, are so glad for the opprotunity to bless the young man of God as he prepares himself for what lies ahead. We got together last night to celebrate his birthday and teased the stuffing out of him for the Wii Fitness Age of 71 that he got (which had to be bogus, because he really is quite athletic and agile)! 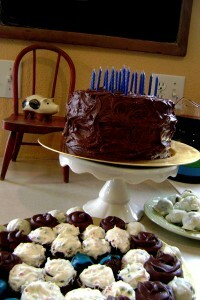 Tara replaced a few of the candles with the kind that you can’t blow out and even though he kind of knew it, he good-naturedly kept blowing on them – creating a major smoke cloud over the kitchen and making my grandbebes laugh with glee. NOTE TO SELF: Cook more for Zach so he doesn’t starve to death under my care. 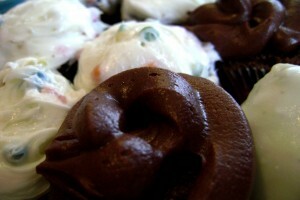 pictured – the 3-layer chocolate pudding cake (very dense and moist) with chocolate fudge icing; I used the extra batter to make a couple dozen mini-cupcakes, some iced in confetti icing, some in the extra chocolate fidge; then with the “extra” cake removed from the layers, I made “cake bites” by crumbling the cake, putting the extra icing in, added some slightly sweetened cream cheese, rolled into balls, then coated in melted white chocolate chips. Used every single bit of cake! 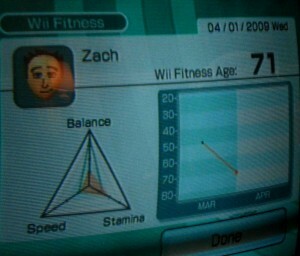 Zach’s Wii screen. 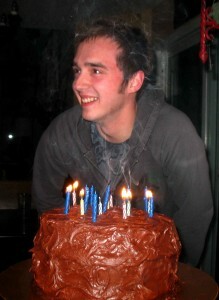 Zach and the candles that wouldn’t die. Happy Birthday, Zach! You are such a handsome fella. Tell your mom and dad they need to come to the reunion. No excuses! Thanks for being a kind, good natured, quiet, cousin that pretends never to be annoyed with the dog or the kids! Happy Birthday house mate!!! I still think it’s so funny that I NEVER see you and our rooms are 1 foot apart…we should change that:) I’m so glad you are here and it’s a blast doing the internship with you…although I never see you there either. What the heck?!?! Happy birthday, Zach! It’s good to have you around and I’m glad that we get to see you growing into such a cool man when I remember seeing you when we first moved to Colorado and you were 3. It seems so long ago! I love you, cous! Zach, me and your dad wish so much we could have been with you for your 19th birthday. It just means that the next time we see you we will hug and kiss you so much you will be embarassed!!!!! I assure Aunt Jeanie that you won’t starve as long as I keep the freezer stocked with both of our favorites… Hot Pockets! I love that I actually get to tease someone because I am the one usually being teased. I love that you are one of the easiest people to talk to because you listen;) I need to learn that from you! Happy Birthday! You look good for 71;) hahaha. Thanks so much everyone! I’m so glad I got to spend my birthday with all of you, it was awesome!